Blog-o-Mania alert: Shrink Rap gone wild, please see ClinkShrink's posts (with more to come) below. My husband is getting off easy. Last time his team lost after so much promise, he ended up as the subject of an Op Ed piece in the Boston Globe. Now I have a blog. He was thrilled when the Ravens made the play offs. Thrilled? Well, pleased, that's about the level of his halted expressiveness on things so important. Saturday morning, decked out in his Ravens sweatshirt, he was anxious. Very anxious. When they win it's mostly a relief. My son, who appears to be more mentally stable about sporting events while still being an avid and exuberant fan, was actually happy. Son was sad. He told me heard on the radio on the way home that three fans had committed suicide: I'm gullible enough to have believed him. Husband was morose. Sunday morning, he woke up and put his Ravens sweatshirt on. "I'm going to hope it was a bad dream and go down to the stadium at 4:30 and see what happens." This, I'm told, was a joke. He TiVo'd the game. Now he watches bits and pieces, a way of processing his grief, I suppose, though it seems maladaptive to me. Move on. It's only a game. Now that's a sentence that would result in violence if ever said out loud where I live. It's not in the DSM. It should be, perhaps with specific team modifiers. Cyclothymia, seasonally influenced, Red Sox Nation fan. 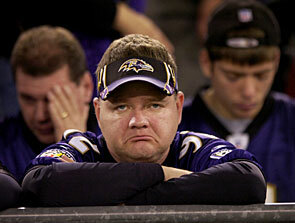 ---Please note, my guys are Red Sox and Ravens fans, with equal devotion. Ravens Mania, not otherwise specified. Borderline Eagles Disorder (for Roy and Carrie). I'll leave it to Roy to blog about treatment options. Now there's a podcast for you. I take it your husband doesn't read your blog? I painted my face blue and white, well, a friend did it for me, my senior year in highschool when our football team went to the State Championship Final. I still have that game recorded on audio, as they broadcast it over the major talk station here. It came in handy at the five year reunion; we had a memorabilia area, and we put the game on play and it really brought you back. It's not like 5 years was that long, but now it's 15. Anyway, I felt wild and crazy getting my face painted in our school colors. That's the most I've ever done, and just the once. For me (seriously), I am both a Chargers fan and a Patriots fan. My head almost exploded in ambivalence.